Are you thinking about making homemade kefir? One of my life goals this year is putting my health first. Therefore, this involves more exercise, more vegetables, and a new addition to my healthy eating plan: kefir. First of all, Kefir is a fermented milk drink made from kefir grains. Secondly, it has a tart flavor, similar to a drinkable yogurt. Finally, it can be made from any type of milk including cow, goat, sheep, coconut, rice, or soy; which makes it perfect for individuals with dairy allergies. 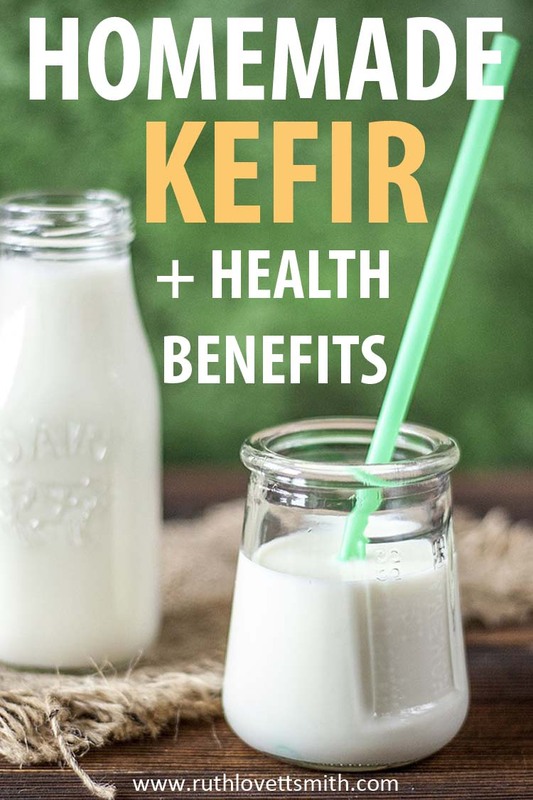 Because kefir is a fermented milk, it is full of probiotics, vitamins, and minerals. Do a quick internet search and you will find how important probiotics are to your gut, and overall health and well being. When you make your own kefir, you know exactly what goes into it. You can purchase kefir at the grocery store. However, there are often extra ingredients added to thicken and preserve it. Therefore, it makes sense to make your own kefir. Making homemade kefir is also simple, inexpensive, and you end up with a better product. Making homemade kefir starts with purchasing kefir grains. I purchase my Organic Milk Kefir Grains on Amazon. You can purchase dry grains (that need to be re-hydrated) or active grains, that you an use right away. Hydrated kefir grains look similar to cottage cheese curds. You’ll want to follow the instructions that come with your grains, however following is a general guide of what is involved. When first making homemade kefir you’ll need kefir grains, and pasturized milk. Above all, avoid ultra pasturized milk. Ultra pasturized milk goes through a high heating process, therefore it has very little bacteria left in the final product. I personally prefer organic milk and/or antibiotic free milk made from grass fed cows. You’ll also need a glass mason jar, coffee filter, rubber band, fine mesh filter (plastic or stainless steel), and plastic spoon. Avoid using any types of metal aside from stainless steel. Your kefir is ready when it has thickened and has a tart taste. Typically it takes a while for kefir grains to revive and get back to full strength, hence you’ll throw away the first batch or two. Over time, your kefir grains will multiply. This means you can start adding more milk. As a result, you’ll end up with more kefir. You can drink kefir plain, or add vanilla or fruit juice to sweeten it a bit. My boys drink it up in a morning or snack smoothie. Check out my kefir smoothie recipe by clicking on Strawberry Banana Kefir Smoothie Recipe.